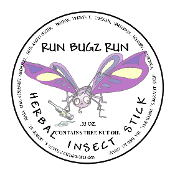 An all natural herbal lotion stick that helps prevent the attack of Nature's biting bugs. Contains sweet almond oil, shea and coco butter, beeswax, vitamin e, lavender, lemongrass, citronela, rosemary, peppermint, lemon eucalytus, and catnip essential oils. 2 oz.